Maybank Design & Send Your Very Own e-Card for Christmas to friends and loved ones! Too busy to post your Christmas card? Don't worry! 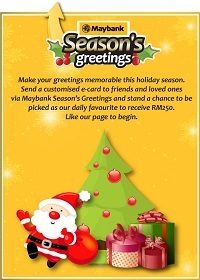 Send a customised e-card to friends and loved ones via Maybank Season's Greetings! Make your greetings special and memorable this holiday season! Visit Maybank facebook page for more detail! And, you might stand a chance to be picked as daily favourite to receive RM250!